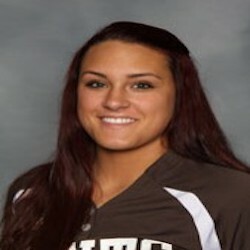 Is a senior catcher and designated hitter at University of Saint Francis where they have qualified for nationals two out of her three years. Made her collegiate debut behind the plate and at bat starting 51 games with an average of .338 with 24 RBIs her freshman year and an average of .375 in six games at the CCAC tournament. From sophomore to junior year she started 72 games with a .273 and a slugging average of .320. She is also a CCAC All-Academic Team selection for two years in a row. In high school she played for Plainfield South under head coach Tara Singler and was a four-year letter winner.